The US Army was powerfully well-armored and equipped, but fresh to wa, and it showed. Organization suffered from a surfeit of peacetime theories and training was insufficient and ill-applied. Despite such failings the US GIs and their commanders learned very quickly, adapting to German tactics and the realities of mechanized warfare. The Axis forces in North Africa were seasoned by years of fighting against increasingly powerful British and Commonwealth forces, and were led by one of the Reich's most capable generals. The German doctrine of mechanized warfare had proved itself time and again, but ever-growing logistical and supply problems were blunting its effectiveness. 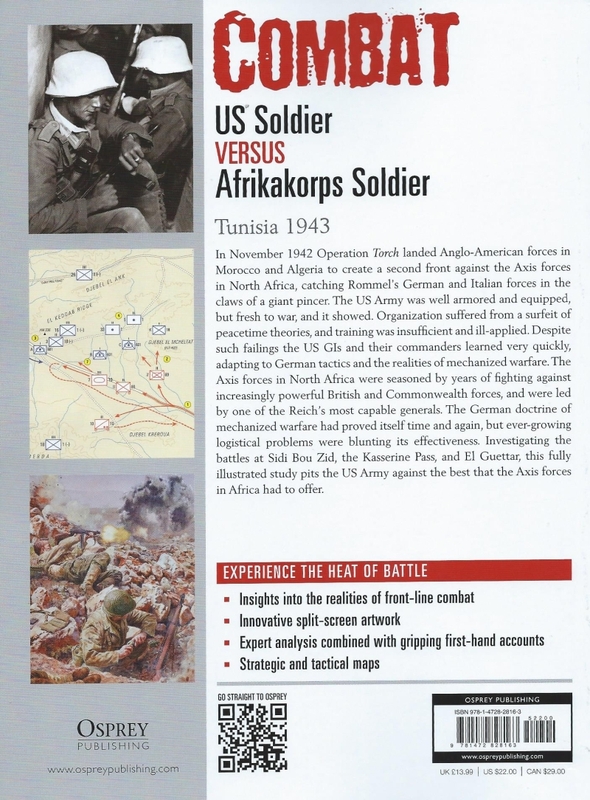 From Sidi Bou Zid to El Guettar, this fully illustrated study pits the US Army against the best that the Axis forces in Africa had to offer. The Opposing Sides - this chapter is broken down into five major sections for each side: Origins and Organization, Training and Tactics, Logistics and Morale, Command, and Communications. 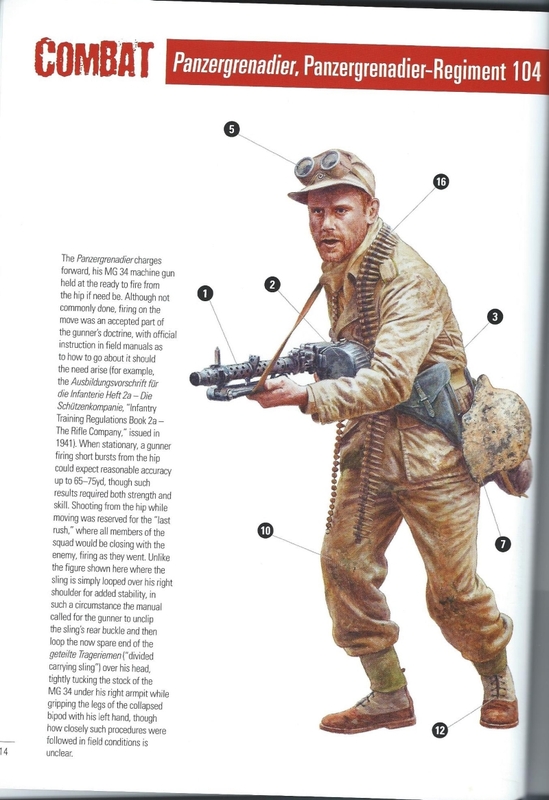 The first section gives the reader a brief summary of where each side was during the time of the campaign, as well as a rundown of typical equipment used by a typical soldier from each side. Training and Tactics gives one a sense of the types of armored and motorized forces, as well as artillery used. The rest of the sections continue this basic arrangement: providing brief overviews of logistics and command structures, naming major players like Major General Fredenhall and Lt. General Patton, as well as Generalfeldmarschall Rommel. Sidi Bou Zid - February 14-17, 1943 - the first of three chapters dedicated to some of the major engagements in this theater of the war. The chapter gives a Background to Battle, a Map and Key of the battle including a general schedule of events over the course of the four days, and a sidebar of the battlefield environment. A concise summary of actual combat completes the chapter. 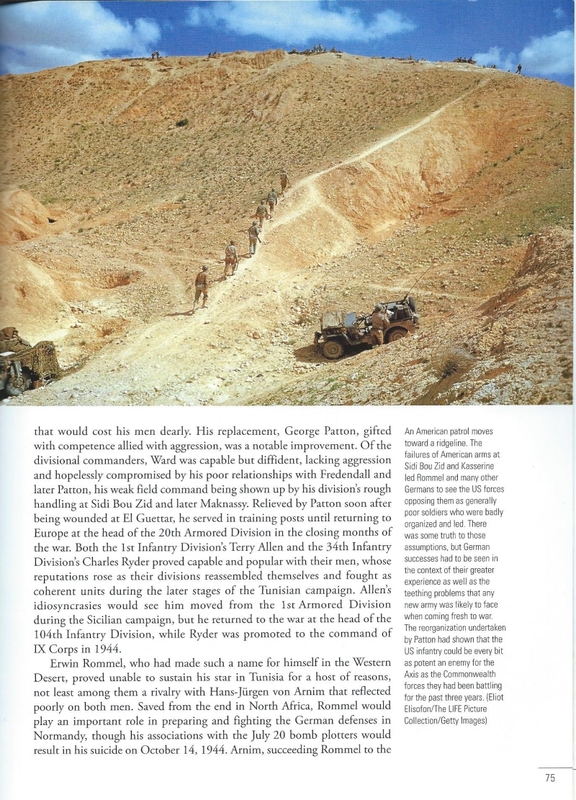 There are sidebars to highlight a major player from each side of the battle- John K. Waters from the US Army and Rudolf Gerhardt from Afrikakorps. 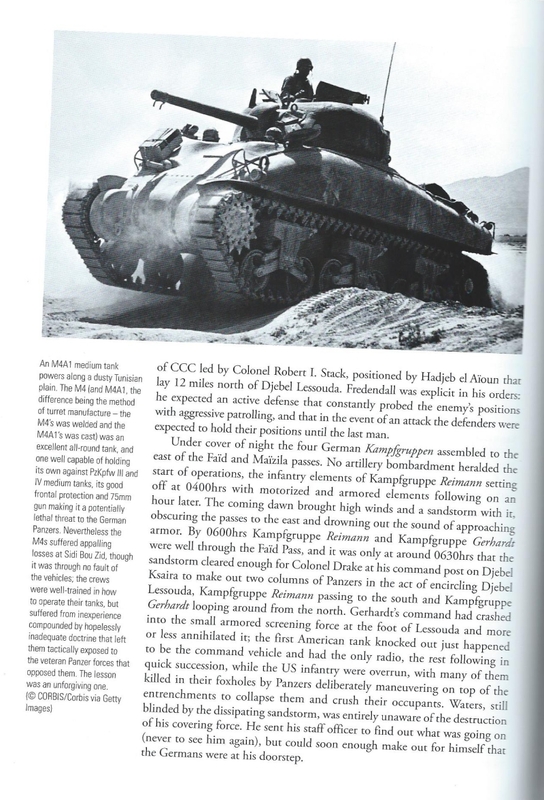 The Kasserine Pass - February 19-20, 1943 - follows the same format as the former chapter but centers on another major battle that follows so closely on the heels of the Allied defeat at Sidi Bou Zid. 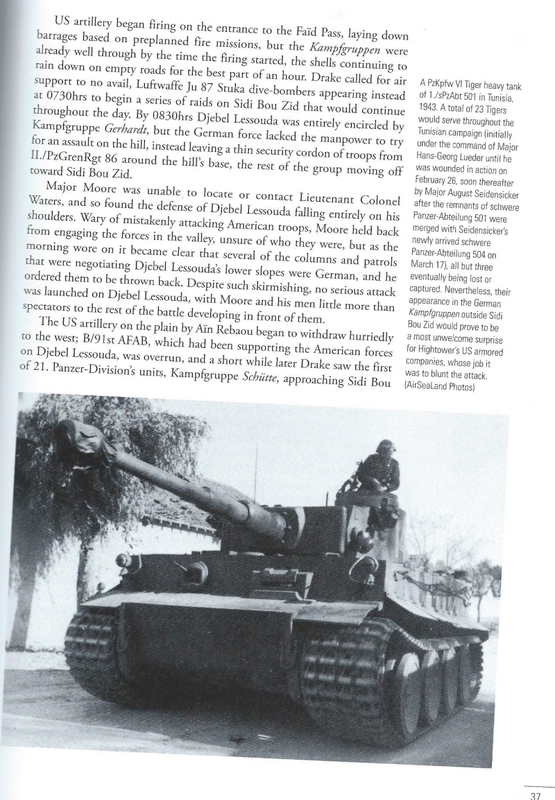 The Allies didn't fare much better at the Kasserine Pass, and the book goes into detail into how things progressed for the Germans as they handed the Allies another defeat. El Guettar - March 23, 1943 - Events leading up to this final battle covered in the book set quite a different stage of events for both forces. Rommel had been sent back to Germany due to exhaustion, replaced by Hans-Jurgen von Arnim. Fredenhall's failings led to his replacement by Eisenhower with Patton on March 6th. German victories up to this point led to an arrogance and overconfidence that grossly underestimated the Americans aligned against them. American artillery and tank destroyer halftracks helped bring about a very different outcome. Analysis - this chapter helps give an overview of how, despite command deficiencies and lack of experience on the part of the Americans that were an immediate disadvantage, a change in command structure and organization could eventually lead to a shift that was enough to bring about a very different outcome. 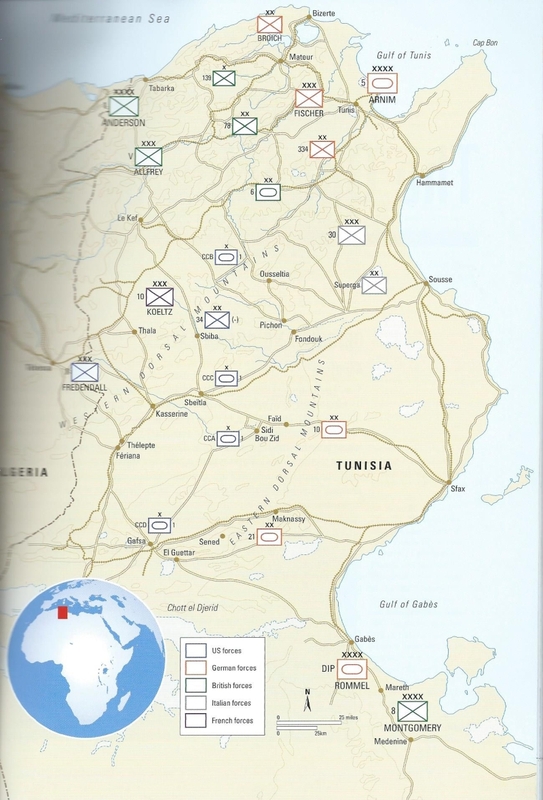 Aftermath - in the few pages of this chapter, the reader is given an effective summation of events and helps understand how the lessons learned in combat here helped to build a strong foundation of tactics that would lead to eventual Allied victories in Italy and Western Europe into Germany. Osprey continues to hit it out of the park with this Combat series. Each chapter is interspersed with excellent black-and-white photographs, color maps, and an occasional period color photograph. The images are ones not normally seen and give a great support to the text. This volume is an excellent addition to the series and provides a valuable resource to the historian or modeler interested in recreating armor, artillery, or infantry units from the desert campaign in Tunisia. I highly recommend the book and offer my sincere thanks to Osprey and IPMS-USA for the review copy.